Where to find Cobalt and how to mine it in No Man's Sky NEXT. In No Man’s Sky NEXT, one resource many players want to learn how to get is Cobalt. This is because Cobalt is one of the most valuable resources available in No Man’s Sky NEXT. Cobalt is a mineral marked with the symbol “Co” and 198.0 base units. Cobalt is useful in a variety of different crafting projects, such as creating an Advanced Ion Battery by using a Portable Refiner to derive Ionised Cobalt from pure Cobalt. If you’re struggling to find Cobalt, we’ve got you covered. Below, we’ve put together a quick guide on how to get Cobalt in No Man’s Sky NEXT! 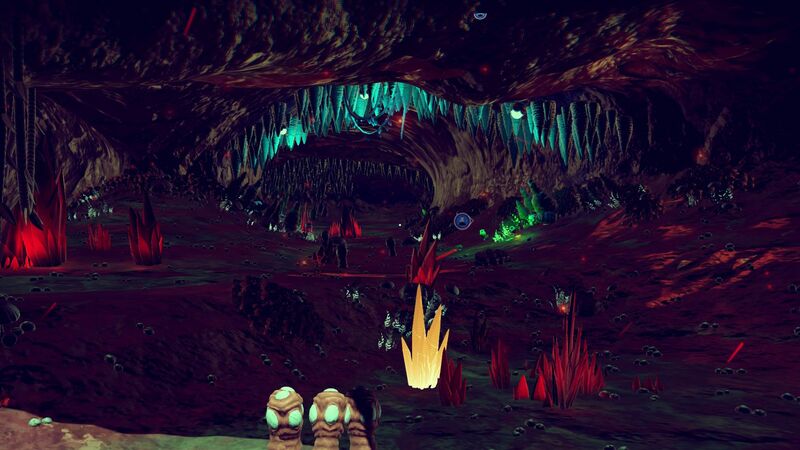 Caves are the best place to mine for Cobalt in No Man's Sky NEXT. In No Man’s Sky NEXT, Cobalt is fairly easy to spot. Cobalt has a blue tint, and runs in veins that you’ll need to mine. To mine Cobalt, you’ll need a Terraforming Tool/Terrain Manipulator attachment for your Multi-Tool. This attachment can be acquired from one of the game’s early missions. In terms of where you can get Cobalt in No Man’s Sky NEXT, caves are the best place to look as Cobalt can often be found on cave walls. Another thing to keep in mind when looking for Cobalt is the fact that there are two main sources of Cobalt in No Man’s Sky NEXT. These Cobalt sources include Stalagmites, which are a type of rock formation that grow on cave floors, and large blue Mineral Nodes. Unlike other resources and materials, Cobalt can be mined instantly once you’ve found it. To mine Cobalt, you’ll need to have a Terraforming Tool on hand. With it, you can press Triangle or Y to switch to the Terraforming Tool from Firing Mode. With that done, you can then begin mining Cobalt. For more on No Man’s Sky NEXT, be sure to check out some of our other guides including how to get Chromatic Metal in No Man’s Sky NEXT, where to get Coprite in No Man’s Sky NEXT, and how to build and use a Portable Refiner in No Man’s Sky NEXT. By reading through this guide, you should now know how to get Cobalt in No Man’s Sky NEXT.